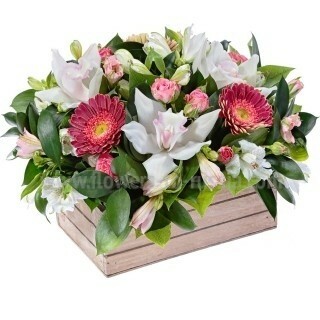 The original composition of snow-white cymbidium orchids, pink mini-gerberas, fluffy white and pink alstroemerias and tender bush roses together with lush green ruscus and salal is a sample of perfect sense of style that cannot leave indifferent. If for any reason the recipient of flowers is not happy with the bouquet, please infom us within 24 hours of delivery and we will be happy to replace the flowers. Prices are represented in U.S. dollars. Your account will be charged acc. to official CB RF rate. Read about currency conversion here. All prices include local taxes, service fee and a card with your message translated to Russian if desired. Delivery fees will be added at the checkout. You can find the delivery fees here. Read about substitution and delivery prior to ordering.